Porcelain or Dental Ceramics is the best aesthetic material available at the moment. Porcelain reconstructions can be utilized in almost any clinical situation: dental crowns, small or extended dental bridges, removable partial dentures or dental implant restorations. Porcelain is superior to any other aesthetic material used in dentistry today because it has great aesthetic features (greater shade range, translucency very close to natural teeth) and, at the same time, an excellent resistance to chewing forces. 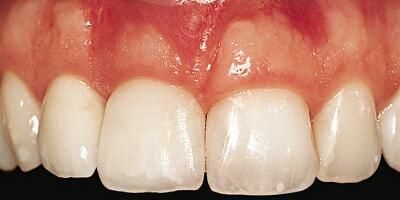 Porcelain fused to metal reconstructions are widely used in dentistry. Porcelain fused to metal restorations have a metal shell on which porcelain is fused in a high heat oven. The metal frame provides strong compression and tensile strength as well as proper support for the porcelain that will be fused on it. It has a reduced thickness and it perfectly fits the prepared teeth. 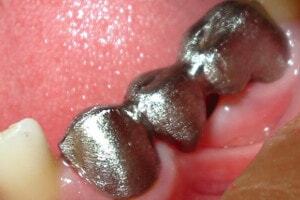 The metal alloys used in combination with dental ceramics are specific. Their composition allows a powerful chemical bond with the porcelain layer fused on top, hence greatly increasing the strength of the connection between metal and porcelain. This is one of the most important advantages of porcelain fused to metal. The metal-composite or metal-polymer connections are significantly inferior as the aesthetic material is held in place only in specially prepared areas on the metal frame. The quality and price of porcelain fused to metal restorations largely depend on the type of metal alloy used to manufacture the frame. These types of alloys have only base metals in their composition. 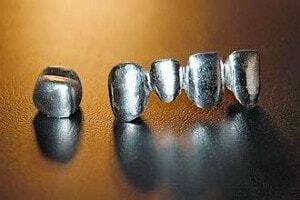 The most common base metals used in dentistry are titanium, chromium, nickel, aluminum, iron or tin. Although they don't have the same attributes (with the exception of titanium) as noble metal alloys (gold, silver, palladium), porcelain fused to base metal alloys reconstructions are strong enough, durable, aesthetics are good and the price reasonable. Various types of reconstructions can be performed: dental crowns, small or larger dental bridges and different types of prostheses supported by dental implants. Titanium alloys are special kind of base metal alloys with superior qualities. Because of this, titanium alloys are very close to noble alloys. They are widely used in dentistry mainly for dental implants but also for various types of prosthetic devices. The price is higher although it usually doesn't reach the cost of gold alloys based restorations. Although referred to as a gold alloy, this types of metal alloys are actually composed of many different types of elements, including gold, platinum, palladium, silver, copper, and tin. The first four elements listed are noble metals, while the last two listed are base or non-noble metals. The gold alloy is of better quality when it is high in noble content. As the rest of the alloys, gold alloy develops very strong chemical bonds with the ceramic layer. 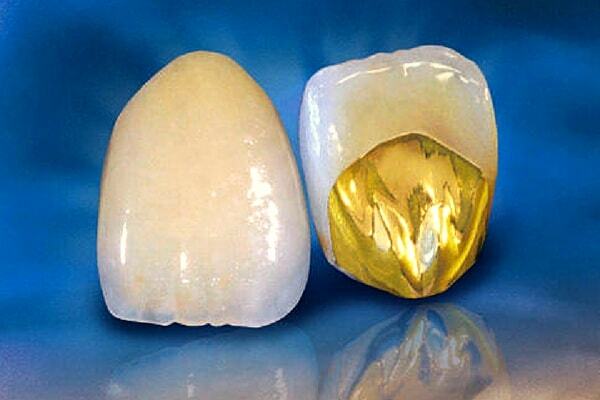 Dental gold is an alloy that is used only in dentistry. 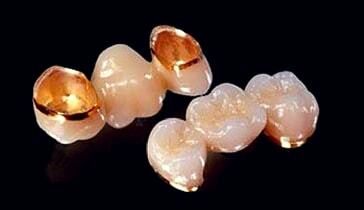 Gold alloys used for ceramic restorations have a specific composition. Gold alloys used for other types of prosthetic devices have a different composition. Why is gold alloy superior ? Gold alloy never corrodes. What does this mean? Some metal alloys, under the influence of saliva, may suffer in time a phenomenon called corrosion. 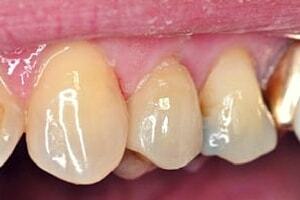 This may lead to the appearance of an unsightly grey coloration in the upper part of the dental crown (see image). Gold alloy has superior strength and resistance. The main advantage is that gold alloys can be manufactured at a very low thickness and still preserve strength and resistance. Porcelain can cover the metal core on all sides, living no parts of the metal visible. Another variation is that crowns are made with a partial veneer that covers only the aspects of the crown that are visible while the remaining surfaces of the crown are bare metal. The first of the two variations has superior aesthetics. 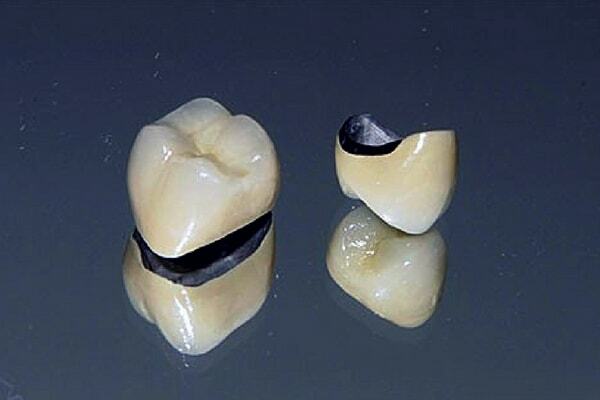 The thickness of the ceramic layer is 1.5 to 2 mm depending on the area of the tooth. It has a very good resistance to chewing forces and great aesthetics. There is a huge range of colors, with the possibility of combining them. Consequently, porcelain will give the crown a tooth-like appearance and can be color matched to the adjacent teeth or gingivae. 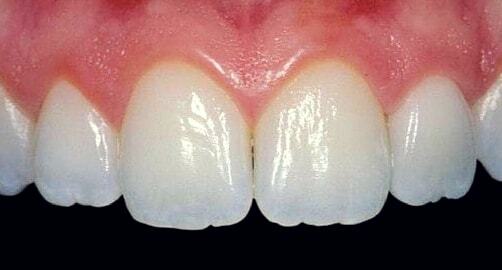 Moreover, porcelain has a translucency that resembles the enamel, which highly improves its appearance. Does dental ceramic crack when eating hot food ? Porcelain is not influenced by temperature variations. It does not crack after eating or drinking higher temperature products. Ceramics are fused in special ovens at temperatures that can rise over 1000 degrees Celsius (1832 Fahrenheit). It is obvious that temperatures like that will never be reached inside the mouth cavity. Why does porcelain chip when biting on harder pieces of food ? Porcelain is not so resistant to certain types of forces. These are especially high-intensity forces acting suddenly and off the axis. It is advisable not to bite on extremely harsh pieces of food and not to overstress the ceramic restorations. Dental ceramics means the same as dental porcelain ? Yes. Both terms describe the same thing. We will use both forms in our presentation. !! !Porcelain is a very good and strong dental material. However, it is only an attempt to replace natural teeth. No dental restoration can ever achieve the strength and resistance of natural teeth. Zirconium is a very hard white ceramic, which is extremely durable and tough. 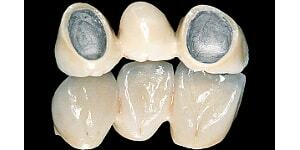 Zirconium can be used as base material for porcelain restorations or, alone, in all-zirconium restorations. All the details are shown in the next chapter. All ceramic or full porcelain restorations are constructed entirely from porcelain without a metal or zirconium frame. 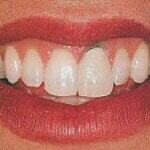 They are indicated in front areas (incisors especially) where aesthetic demands are very high. With no supporting frame, they are less resistant, and therefore it is not advisable to design them in posterior areas (the molars) where chewing forces are high (with some exceptions). 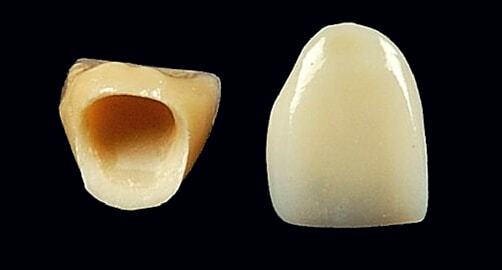 All ceramic restorations are highly aesthetic because they are made entirely of porcelain. They do not have the strength of zirconium or metal-based restorations, therefore they can be used only in certain clinical situations. It is not advisable to design full ceramic bridges that exceed 2 or 3 units. All ceramic crowns require complex methods of execution using special types of ceramics and, for this reason, have a fairly high cost.